Safety and health at work | Be Water, S.A. In our group of companies, safety and health of workers is one of the main pillars of our business and operational performance. Our professional team periodically conducts an exhaustive survey of all facilities in order to detect possible situations that may endanger the health and safety of our employees and all those who collaborate with us. Result of this commitment, at the level of human resource allocation and management of financial resources, have been our results on accident rates which according to the International Labour Organization (ILO) are classified as good. Given our sphere of influence, we consider what an excellent job has been done by our entire team because, on a daily basis, we operate directly in activities with special risks such as, for example works in galleries, shafts and tunnels and work at risk of drowning. In all our activity, the area of prevention is considered a priority, a specific area where we operate in different ways and involving all our professionals. 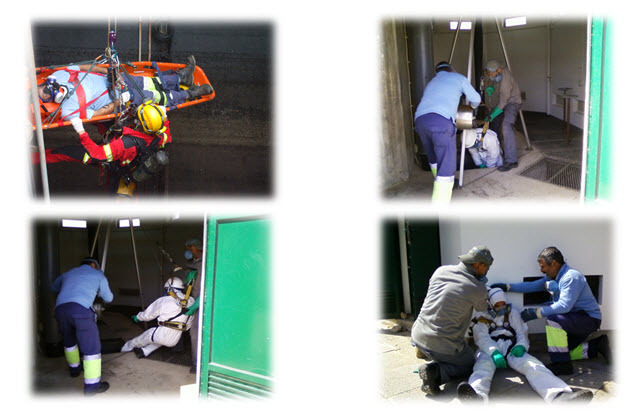 We conduct periodically planned emergency drills in various scenarios. Conducting emergency drills in various scenarios.